At Redbooth I wear many hats: billing operations, finance, HR, and generally making things happen. Working with a bunch of cool and geeky developers is a lot fun. It can also be an interesting learning experience. Every now and then on the billing side, we run into a technical challenge in our system with an account. Whenever we encounter an issue with a customer subscription, we go into our database report system to figure things out and resolve the issue quickly. Sometimes a different kind of approach is required — it helps to have a developer’s eye and the ability to dig into the code. So one day I realized that I could develop a better understanding of the code myself. I started looking into some basic intro coding courses and one thing led to another. The next thing I knew, I was looking at the next event for the Barcelona Ruby on Rails group Rails Girls. 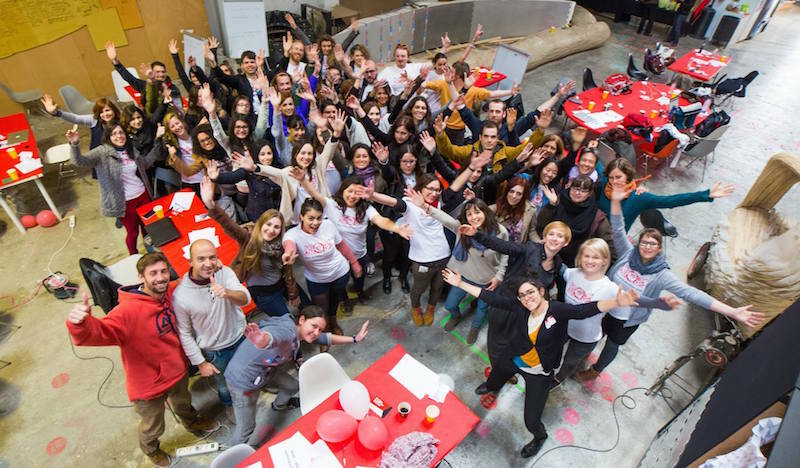 This fantastic non-for-profit initiative makes the world of technology and coding more accessible to women who are eager to learn more about Ruby on Rails. No previous experience needed — just you, your laptop, your curiosity, and a willingness to learn. Sounds like fun to me! Fran Casas, a Platform Developer at Redbooth, was also going to be there, serving as one of the Rails Girls mentors. The goals of Rails Girls resonated with him as well. On the day of the Rails Girls workshop, I headed to Fab Lab, a creative co-working space in an industrial part of Barcelona and weekend home to Rails Girls. Each participant was assigned a group and a mentor. We started off by putting some basic programming commands into practice with a live-action game called “Roboto.” Collaborating in a group, we had to guide a human “robot” (our mentor) through a maze with a series of simple written commands. It was a really cool way to be introduced to problem-solving and analytical thinking. Fran and the other mentors guided us through the software installation, basic programming concepts, and the frontend and backend of building our first web diary totally from scratch. The weekend program was intense! In addition to the coding activities, we attended a series of informal talks and presentations mainly run by women empowering others to start in the tech world. At a Rails Girls workshop, you won’t learn everything you need to know about coding in a weekend — but that wasn’t the goal. Rather, it was about acquiring basic tools and visibility into the programming community, and getting better acquainted with Ruby on Rails. Everyone involved was so generous with their time and energy: all of the mentors and organizers are volunteers. The event also wouldn’t be possible without its sponsors — and I’m proud to say that Redbooth was one of them! So, where do things go from here? Fran plans to continue mentoring: “I’ll continue as long as I can to lend a hand.” And as for me, I’m just getting started! Since completing the weekend workshop, I’ve signed up for online courses in Ruby, completed a HTML/CSS event and even built my first page in just two hours! I’m looking forward to going to more meetups with Rails Girls, too. I don’t know where this will all lead, but there’s one thing I know for sure: I want to always keep learning.